Students from all county schools are invited to participate in this academic competition, answering history, geography, business, people, and sports questions about Lawrence County. The Lawrence County Historical Society will hold its Annual Trivia Competition at Northminster Presbyterian Church on Thursday, May 9, 2019 at 9 AM. Boxes of questions may be purchased at the Historical Society’s GIFT SHOP and in our ONLINE eSTORE. The facts, covering local history, geography, people, buildings, businesses, industry, people. and sports, are written on a set of cards created by the Historical Society. Students study their cards in class and at home throughout the year in preparation for the event. After practices, the activity culminates with four competitions – Junior High Individual, Junior High Team, Senior High Individual, and Senior High Team. Historical Society members and school advisors serve as judges for the competitions. LCHS Board member, Stephanie Fulena, coordinates and moderates the event each year. Cash prizes to the winning students and plaques for the winning schools are presented at the Jr. High and Senior High divisions. 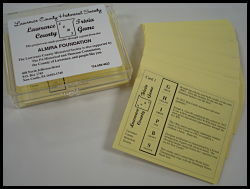 The challenging game card (for children and adults) can be purchased at the Society or online on our website. Event details will also be published in the New Castle News. To see previous winners, visit our website Youth Education page.